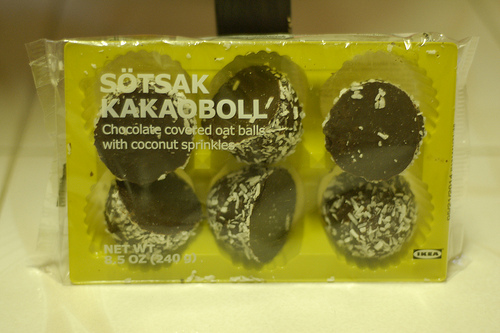 On a recent business trip to New York, I searched a few grocery local stores for a new sweet treat to taste. I wanted a taste of coffee without too much caffeine so I decided on this product. This is the first time I have seen a product by Perugina, an Italian company established in 1907, so I thought it would be an interesting experience. Everything from this product, from its appearance to its taste, seemed like a ripoff of the classic ‘Nestle Crunch’. Nestle Crunch has been around since 1938, but I’m not sure if Perugina’s product was first of not. If I had to guess I would go with Nestle Crunch being first. Ironically Nestle purchased Perugina in 1988 – I wonder how this affected their recipes. My biggest beef with this product is that there is practically no coffee flavor, its overpowered by all the sugar packed in. The ingredient list also is consistent with this since coffee is listed after sugar. This one of the times when I will probably not finish the entire bar and it will end up in the trash can. To be fair, its also one of the times I didn’t pay attention to the ingredients before purchase. In a 40 gram serving (2.5 total servings) there is 220 calories and 19 grams of sugars. This is pretty typical for chocolate bars with a low percentage of cocoa. It isn’t listed on the package, but from the taste and amount of sugars I would say roughly 30-40%. Because of the high sugar content (listed first on the ingredient list) and low cocoa content, I can’t recommend this chocolate from a nutritional perspective. One surprise is that crisped rice is used in Nestle Crunch, whereas this product has modified food starch and wheat maltodextrin replacing that. The presence of artificial flavors really puts the nail in the coffin for this chocolate. I have no idea what part of this product is “genuinely Italian”, since both the flavor and ingredients are quite generic. I guess this company still gets shelf space since it has been around for over 100 years (and has the backing of Nestle), but if they want to stay competitive they should try new recipes with more unique flavor and healthy ingredients. Full ingredient list: Sugar, milk, cocoa butter, chocolate liquor, cappuccino crispy (nonfat milk, sugar, coffee, modified food starch, wheat maltodextrin), milkfat, sunflower lechitin, artificial flavor. I got this for $4.99 at Cafe Hestia near Grand Central Station in New York. With a load of sugar, very little chocolate and hardly any coffee taste, this product is a major letdown. If you are a bug fan of classic chocolate like Hershey’s you might enjoy this, otherwise pass it up for more healthy, refined chocolate. 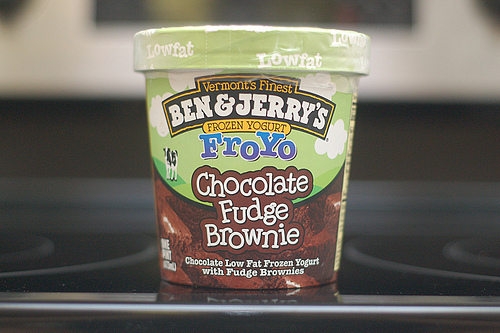 This ice cream is from the “FroYo” series which takes popular Ben & Jerry’s flavors and turns them into frozen yogurt with reduced calories and fat. I had reviewed the ice cream (non lowfat) version of Chocolate Fudge Brownie here, and this time I thought I would review the lowfat one. It’s great when you want a deep, rich flavor without quite as many calories. This dessert tastes very similar to the ice cream version. Spongy brownie pieces float in a sea of rich, gooey chocolate, saturated with sugary goodness throughout. I’m sure if did a direct taste comparison where I alternated between spoonfuls of these two products I would be able to taste the difference more clearly, but eating it normally the FroYo doesn’t taste anything like “low-calorie” or “low-fat” – which is a good thing. The main difference is that the texture is more icey and less creamy. It’s midway in between eating normal ice cream and Italian ice (the latter of which has no milk and only water as its base). The first time I tried this I didn’t taste any of the yogurt flavor. I tried it again, paying close attention, and was able to detect yogurt very subtly, more as an aftertaste than anything else. More on this below. 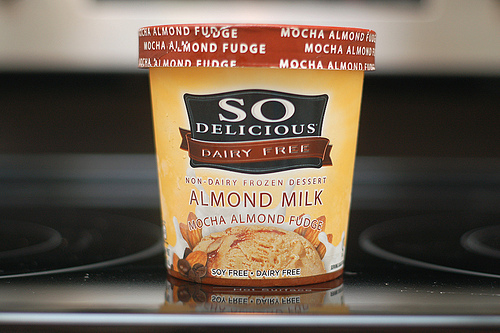 For a single 104 gram serving there is 180 calories, slightly below average for an ice cream of this type. Consistent with the “lowfat” branding, there is only 2.5 grams of fat. Compare these figures to the normal Chocolate Fudge Brownie – 270 calories and 12 grams of fat – and you’ll see a huge difference. For those of you who are more concerned about sugar intake than calories (which I sometimes am), this product isn’t too great. There is a whopping 25 grams of sugar, only 2 grams less than the standard less-healthy version. I’d wish they would have reduced it a bit more, but I guess the characteristic flavor would be ruined if they took out any more sugar. Protein amount is typical at 5 grams, and fiber is 2 grams a serving. As I mentioned above, this product has only a tiny hint of yogurt taste. I checked on what “frozen yogurt” really means, and it looks like besides containing yogurt, it is also typically more tart, and lower in fat due to milk used in place of cream. Comparing ingredients against the normal ice cream version, we can see that both contain skim milk and cream. However the FroYo version contains more skim milk than cream (order on label 2nd and 9th, compared to 3rd and 1st on the ice cream version). So this frozen yogurt does contain less fat, although it is not particularly tart. Technically this product can be placed in the “frozen yogurt” category because of the presence of yogurt powder (11th place) and yogurt cultures (20th and last place). However, because of the small amount of these ingredients, which is reflected in the taste, I wouldn’t really consider this a true “frozen yogurt”. It looks like Ben & Jerry’s is just using the “yogurt” nomenclature to associate nutrition and health, and as a result sell better. I can’t say whether the yogurt cultures have any nutritional benefit or not, but they in are such small proportion I doubt that is much an effect, if at all. I’d prefer B&J’s either drop the yogurt branding and remove the little yogurt that is present, or increase it so this dessert can honestly be called a “frozen yogurt”. Another trick they use to make this product lighter is using water as a filler – it’s listed as the #1 ingredient and is the main reason for the texture change I discussed previously. I think this is generally a great idea for health-conscious frozen desserts, and when done in moderation doesn’t destroy the flavor. I’ve listed both versions’ ingredient list below. If you compare you’ll see that except for the yogurt, milk/cream, and water differences, they are very similar. CREAM, LIQUID SUGAR (SUGAR, WATER), SKIM MILK, WATER, SUGAR, COCOA (PROCESSED WITH ALKALI), WHEAT FLOUR, COCOA POWDER, EGG YOLKS, BUTTER (CREAM, SALT), INVERT SUGAR SYRUP, WHOLE EGGS, EGG WHITES, GUAR GUM, SALT, CARRAGEENAN, VANILLA EXTRACT, MALTED BARLEY FLOUR, SODIUM BICARBONATE. 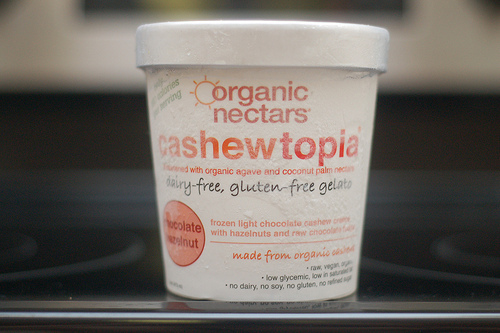 One final difference is that the FroYo version does not contain carrageenan, a substance used as a thickener/stabilizer. It turns out there is some research that indicates carrageenan may be involved in tumor promotion, though I don’t think there is any definitive proof for this yet, and currently it is considered as a safe food additive by the FDA. Nevertheless I’d rather do without it if I have a choice. This product is available all over the place. I purchased it for $4.69 at Publix supermarket. This doesn’t stand out as a particularly healthy choice, but when compared against the less healthy non-yogurt version it’s much lower in calories and fat, and still boasts a rich, sweet taste. Once you switch to FroYo I doubt you’ll find the need to return to more fattening ice cream. I like to eat cereal every morning with my family before I go to work. It’s a good way to start the day especially when I can’t always predict when I’ll have time for lunch. To keep things from getting boring, we try to change up the cereal every few days to something different. I had reviewed Three Sister’s Honey Puffs rice cereal in a previous blog entry (see first reference below), and I decided to try out another of their cereals. As you’ll soon find out, these two cereals have a great deal in common. This cereal is pretty much a “healthy” version of Kellogg’s Cocoa Krispies, meaning its supposed to be healthy though in some ways it isn’t much different. This cereal is made of puffed rice, made with a similar process as puffed wheat in Honey Puffs. This gives it a light fluffy texture, and the added advantage of higher surface area without too much volume. In other words, you are eating a lot of air, and as a result you take in less calories, sugar, and nutrients (per spoonful) that you would otherwise if it wasn’t puffed. You could call this a health food in that sense (much like puffed rice cakes), but I actually think of it more as a way for the producer to save money on materials and sell a large bag of cereal with a good percentage of that empty space. It has a moderately sweet chocolate flavor, which is appetizing but not quite what I am looking for in a cereal. The sweetness catches your intention while you are eating but sometime later you realize you really haven’t eaten that much food (at least if you eat a small bowl like I do) and are likely to get hungry earlier than if you ate a more wholesome breakfast. Both the flavor and texture is nearly identical to Cocoa Krispies. In a single 29 gram (3/4 cup) serving, there are 120 calories which is standard for this type of product. Sugar is 13 grams, a bit on the sweet side. There isn’t much nutrition in this product, with no fiber, practically no protein (1 gram per serving), and less than 10% of most common vitamins and minerals. Sodium is nothing special at 150 mg, which is 6% of daily intake. Because of the lack of substance and nutrition, I feel this is really not the best way to get your day started, unless of course you supplement it with other foods higher in nutrition. When comparing this to Cocoa Krispies, as you might expect both the ingredients and nutritional information is very similar. Calorie count is virtually the same (120 calories for one 31 gram serving) and sugars is actually a tad less in the “less healthy” version, at 12 grams. The other funny thing is that Cocoa Krispies has much more vitamins and minerals (compare 25% DV of vitamin A and C to 0% in Cocoa Snaps). 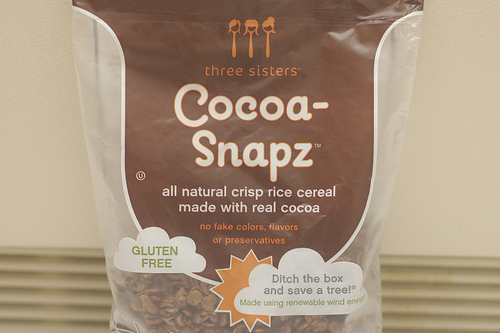 There are a few areas where Cocoa Snapz is healthier than its predecessor. Natural flavor and caramel color is used instead of malt flavor, artificial flavor, and BHT (a preservative). The last of those has particularly scary, with some research pointing to cancer-inducing effects in animal experiments. I’m not convinced it is truly harmful but if a cereal can stay fresh enough without BHT that is clearly a better way go. Available exclusively from Whole Foods. I purchased mine for $3.99. There are 396 grams in the package. 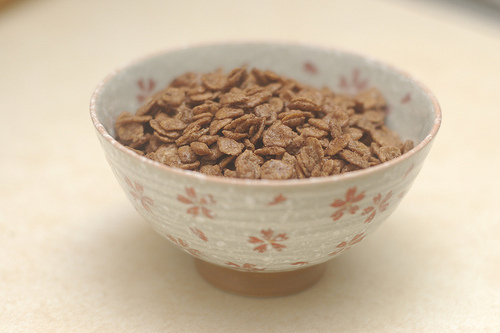 A cereal that closely copies Cocoa Krispies flavor while making it more healthy in some areas (no preservatives) and potentially worse in others (less nutrients, slightly more sugar). If you are a fan of Krispies I recommend trying this, otherwise I would search for a heartier cereal with more nutrition. For Sweets Reporter’s 20th post, I didn’t want to review just any product. It had to be something extra special and extra delicious. 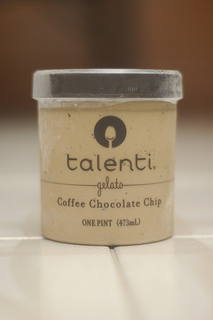 I decided on using Talenti’s Coffee Chocolate Chip Gelato – my current favorite ice cream, hands down. You may have noticed I just mixed terms – is this a gelato or an ice cream? Gelato is supposed to have several major differences compared to ice cream: Less fat, higher serving temperature, more sugar, and slower churning. But this ‘gelato’ has nearly the same amount of fat, if not more, than many ice cream products. I eat it at the same temperature, and the amount of sugar is comparable to ice cream. I can’t speak on how fast it was churned, but without a clear distinction between what makes a ‘gelato’ and an ‘ice cream’, I’ll continue to group these together. After all, ‘gelato’ simply means ice cream in Italian. Anyway, lets get to the meat of this review. I’m looking forward to writing this and I hope you are looking forward to reading it. This is a product that I’ve eaten so many times and just learned to enjoy in sort of a zen state. Rather than thinking about the flavor too much, I simply savor the experience as time seems to slow down. So its a little difficult to give an objective description for someone who is new to this gelato, but I’ll do my best. From far away, things don’t look too different than run-of-the-mill chocolate ice cream. But as you dig in a spoon the texture is somehow thicker and more dense. As I mentioned in previous posts, ice creams generally taste better when partially melted into a half-liquid state, so the creaminess can be felt along the length of the tongue. This product is no different. In fact I’d say the effect is even more pronounced, and this is in line with the recommendation that gelatos are served at a higher temperature than ice cream. Several sensations come as your tongue makes contact with this delightful desert. 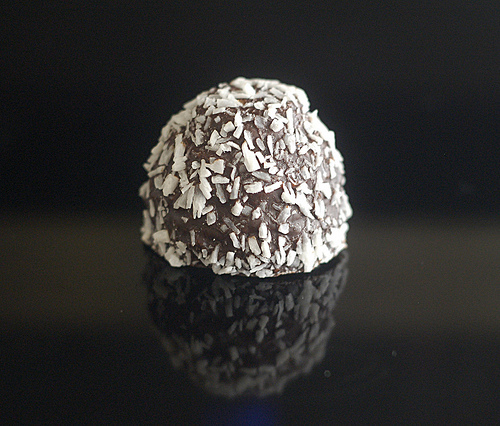 There is a very strong sweetness, backed by evenly balanced flavors of chocolate and coffee. There is also a rich, savory flavor that is difficult to describe in words, but many associate with butter, meat, or cheese. On a historical note, a Japanese chemist was the first to discover this taste which he called “umami” (tastiness) and attributed to it glutamate. He was also the inventor of the (in)famous food additive MSG. Fortunately, the savory taste in this product comes from a much more natural and healthy source, eggs. 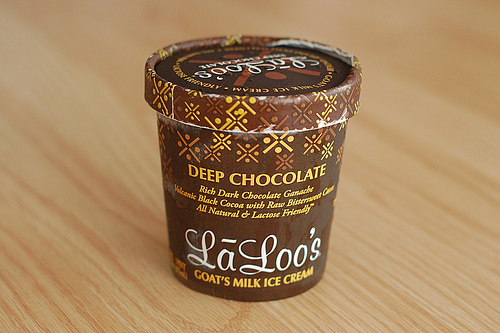 I don’t know of another gelato/ice cream with the same taste, and I think this is one of the reasons I’ve fallen for this product. Awhile back actually tried to replicate this ice cream myself, and after a few batches with successively more eggs I realized those were what was giving such a great flavor. I never did quite get the right taste (or texture, for that matter), but I plan to try again someday. 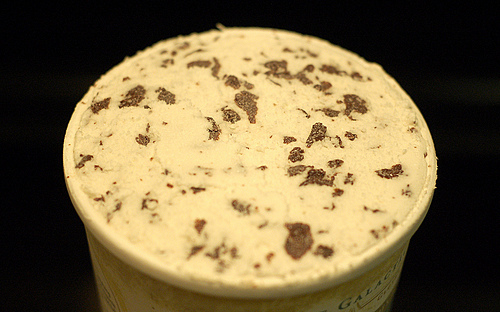 Embedded throughout the ice cream base is a storm of chocolate pieces, little treasures hiding here and there. The company has referred to them as “a ribbon of chocolate”, but its really just tiny chocolate chips, and I enjoy their sweet, chocolate flavor much more than “chocolate flakes” I’ve had in another product. That reminds me of a funny story. This gelato used to be called simply “Cappuccino” and lacked chocolate chips, but sometime last year they changed the name to “Coffee Chocolate Chip” and added in the chips. At that time I was outraged. I even wrote an email to Talenti demanding my Cappuccino back, and went as far as saying that the chocolate chips destroyed the smooth, creamy texture and overpowered the coffee flavor. Now it’s over a year later and I have gotten used to these things. Having said that, I wish I could taste that classic flavor one more time. Maybe I would still like it better. Per a single 1/2 cup (102 gram) serving, there is 240 calories. I would say this is near the average for ice creams I have eaten. As you would expect from the taste, this product has a good helping of sugar – 24 grams per serving. While this is higher than I am normally comfortable with, because of the great taste I make an exception. There are ice creams with much high sugar content, such as Argentine Caramel, made by the same company, with 33 grams per serving. 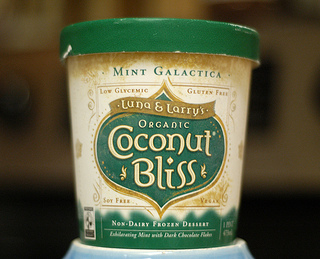 For an ice cream with such a complex flavor the ingredient count isn’t too high (13). Eggs, which give the characteristic savory taste and also enhance the thick creamy texture, are in very high proportion (they are the 3rd ingredient). I don’t know of any other ice cream or gelato for which this can be said of. Because of the high egg content, there is a moderate amount of protein (6 grams per serving). But more than that, the cholesterol value is off the charts, providing over half (57%) of your daily amount in a single serving. Until recently this would have been regarded as extremely unhealthy, but some recent research shows that the cholesterol in eggs can actually be good for you. See link in references section below for more information. Besides the massive amount of eggs, the ingredients are pretty typical. My pet-peeve “natural flavor” is present, and I have sent out an email to Talenti to get further detail on what is really in there. Milk, sugar, eggs, cream, chocolate, dextrose, oil (coconut soybean), coffee, carob gum, natural flavor, soy lechitin, vanilla. One warning for those who aren’t frequent coffee drinkers. I don’t have any specific figures on caffeine present but based on my experience I can say there is a hefty amount in this product, coming from both coffee and chocolate. Add a sugar high to the caffeine buzz and you’ll be bouncing around for quite a while. This sells for around $5 in Publix and other grocery stores, though I have seen it for nearly $8 online. It is a bit pricey but at Publix it occasionally goes on sale for one dollar off, and rarely for half price. Whole foods also carries Talenti gelatos, but I have never seen this flavor there for some reason. A heavenly mix of sweet chocolate and coffee, enhanced by the lush, savory taste of eggs. Except for a few minor issues such as “natural flavor” and high sugar content, its practically the perfect ice cream (or gelato). 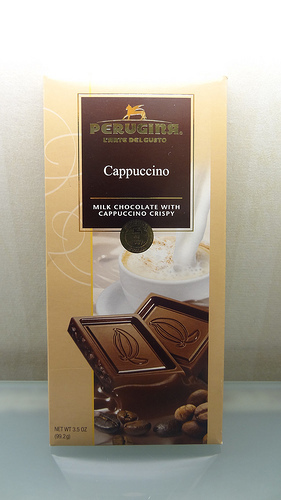 As my current favorite, I recommend it to anyone who enjoys sweets, chocolate, or coffee.